VGB LIVE 78: Banging Jeopardy, Again! The Weekend BANG! is going for the game show title on this weeks episode, as we tackle Alex Trebek and Jeopardy. Spoilers, we do a better job. Sir Aaron Carter, The Real David Webb are all in attendance with Elle Boogie, and Neil from Oblivion Comics and Coffee along for the ride to give you a great show. The show starts out with a little Banging around the web, where we discuss some Overwatch, Get Out, and some of Game Stop’s latest changes. We end it all with a little bit of Ghost Recon beta info and impressions. 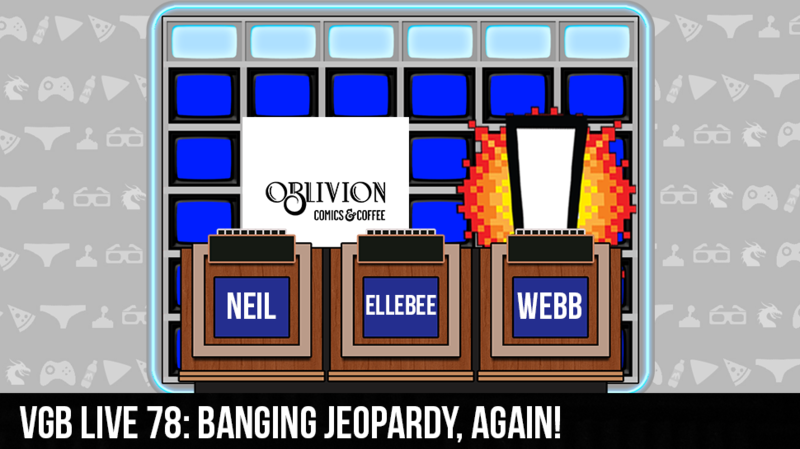 From there we switch gears to a new segment called VBG Jeopardy, and Elle B, Webb, and Neil battle it out for game show supremacy. Is Get out as good as they say it is? Will Ghost Recon be game of the year? Who will be VGB’s first Jeopardy winner? Find all that out and more on this weeks episode of the Weekend BANG!